Buca di Beppo is a chain of restaurants that started with Buca Little Italy in Minneapolis back in 1993. The English translation is Joe’s Basement. 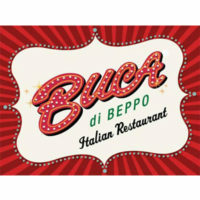 There are over 92 establishments owned by Buca, Inc. Eighty-seven branches are in the United States while there are five franchises in the United Kingdom. The restaurant is known for having vintage photos hung around its walls which is said to have reached over 2,500 pieces in total. They have banquet rooms and semi-private dining rooms for private functions or events. Each room is decorated differently to be comfortable and inviting. Buca di Beppo catering has a lot of options, from Insalate, pasta, lasagna, salads, entrees, dessert and drinks. The menu options make it easy for anyone ordering for big groups. Buca di Beppo has their menu tailored for catering events. The prices are presented either in full pan or half pan and large portions. There is also an option of hosting your event in the banquet area of Buca di Beppo restaurants. Just contact them and they will assist you. The ordering for Buca di Beppo catering can be done through their website. Choose from the list which location is nearest to your event. Then you can see the specific menu for that branch. You can create an account or log in to it if you already have one. There are different guidelines for different branches of the restaurant. There is a 10 mile radius delivery area. A minimum order required, as well as a delivery charge. The menu is complete from Italian feast packages, insalate, special lasagna, pasta, baked pasta, entrée, side dishes, desserts, and beverages. After you are done choosing what to order, you can check out and input your delivery details. In their Italian feast packages, you can choose your salad, a pasta, and entrée. The order also comes with freshly baked bread. Some options also include dessert in the package. A small group of five getting Insalate, a pasta dish and an entrée would cost around $80 to $100. The dishes come in a large size order; which smaller than half a pan. A group of 10 getting the half pan of an Italian feast package can cost around $115 to $220. One of the choices comes with either Caesar salad or a mixed green salad, one pasta dish which can be fettuccine Alfredo or spaghetti marinara and also an entrée which can be Chicken Limone, chicken parmigiana, or chicken Marsala. A large party of 20 people getting the full pan Italian feast package can cost around $220 to $420. This may come with a salad wither mixed greens, Caesar or Apple Gorgonzola, it also includes one or two pasta dishes with different choices. There is also an entrée included, also bread and a dessert. The pricing is similar with other Italian restaurants. With the event you are hosting, Buca di Beppo’s sales manager is available to answer your questions. They also accept reservations for groups less than twenty.